Description:Used 2014 Yamaha G29 Efi for sale - $5,995.00 2014 YAMAHA G29 EFI GOLF CART 2014 Yamaha Drive FUEL INJECTED Gas Golf Cart. New Custom ANVIL Grey ,Black with Black Inserts, New Jake's LIFT KIT, 14" Wheels, LED Head Lights with Blinkers, Brake lights and Horn. Tinted windshield, NEW Rocker Panels, 5 panel mirror, BLUETOOTH Stereo, USB charge port. Fender Flares, YES!!! Heated Seats!!!!! 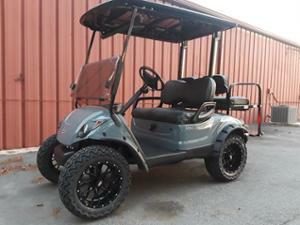 $5,995 call or text anytime (404)618-7363 Financing options available.